Well, what a day. Woke up at five and joined on of the commuters' trains at 7:15. By the time I reached Waterloo, I was more stressed than after my four-hour trip to Hull and back. People spreading newspapers onto your nose, giving you elbow blows, trampling on your feet. . . Now I can fully appreciate Queneau's Exercises in Style. . . Anyway, after three meetings in town, I whizzed back to the office, then a few breathless hours and off to central London again, where we had a wonderful dinner with Rosie Alison and her husband Tim. Since I know she reads this blog, I have promised not to reveal anything about the evening, including publishing gossip and priceless anecdotes that will have to be reserved for my posthumous memoirs in twelve e-book volumes. The only thing I am allowed to say is how humbled I felt as a struggling new author of a book called Bestseller at the spontaneous success of her bestselling book . . .
Where did we go? We went to La Brasserie, opposite the Michelin building in South Ken. We hadn't been there for ages. Food and wines, as always, are delicious – and I have broken my alcohol abstinence tonight as it was a great night of celebration. Blogging as I wait for a delayed train back to Kings Cross. I spent the afternoon at the University of Hull, where I gave a talk to a dozen bright creative-writing students. I hope I didn't depress them too much with my publishing horror stories. But I was surprised, after the many stories I had heard about Hull, to find the city far from depressing. There was even sunshine, and the a pint of Fosters was £1.65 – a ten-minute cab ride to the station £4.50. “We must speak to an editor,” a middle-aged lady with an erect bearing declaims, as to a small gathering. I am the only person at our stall. “It’s about my son’s book,” she bellows, and duly her son, slouching and fidgeting with a soiled cigarette, hoists his eyes to the matriarch, still mute. “He’s written a book,” she reiterates with some vigour (he nods), “and we need to speak to someone in the young fiction department.” I explain the predicament, noting that the son in question must be at least eighteen on account of the tobacco. “Well, give us a card then,” she commands. I acquiesce and she powers around the corner to the next stall, son flopping behind her. I didn’t catch what her badge said but I presume it was “literary agent”. Another incident the next day: having adroitly negotiated his way past a receptionist trained to spot such types, a self-proclaimed technophobe bearing a manuscript shuffles into the office, declaring that he had met with little publishing success at the mercy of the postal system (presumably one of the forces of technology against which he had devoted his literary output), and had resolved to present his work in person. After being informed that this wasn’t really an orthodox or appropriate approach, he pottered back out, leaving the book in its giant envelope with no postage for its return journey. I guess we’ll see him again. This shows some force of character, but cannot trump the writer who, perhaps through poverty or a bizarre and misguided resourcefulness, sent us his book printed on the backs of rejection letters from other publishers. Building success on the back of failure… or not. Hey, The Times' website is back up and can be browsed free of charge. What's happened? Has Murdoch already capitulated, or maybe I am missing something and they're on clear view on Sunday? Curious to know if you know something. The last day of the London Book Fair was pretty quiet and depressing. More mad authors passed by and tried to leave their manuscripts. I was having a meeting with an old timer when a husband-and-wife couple in business suits gatecrashed on us. Opening the suitcase ominously in front of me, the man said: "Can I just ask you a quick question?" I said, "No." The man crumpled but managed a joke: "Ha ha, wrong answer. Why did you say that?" "Because I'm in a meeting," I said, po-faced. "Well," the man said, while the woman smiled, "let me show you something and then I'll be gone." And he produced – I swear to God – a printout of the Amazon page of their self-published book, showing an Amazon sales rank of 3,937. "Only thirty per cent of all books achieve a sales rank of this order, few people know that," the man said, smiling through his beard. "What's your book about?" "Well," the woman smiled, "it's a kind of self-help—" here I waved her to shut up. "We don't do self-help. Bye." To their credit, they left in a split second. The day before, during the launch of my novel (which, by the by, was well attended – many of my publishing friends were there, including Pete Ayrton of Serpent's Tail, Richard Davies of Parthian, Laurence Colchester and François von Hurter of Bitter Lemon Press, Stephen Page of Faber, Gary Pulsifer of Arcadia, Antony Wood of Angel Books, Luke Brown and Alan Mahar of Tindal Street Press, Melissa Ulfane of Pushkin Press, Jane Aitken of Gallic Books, Juliet Mabey and Novin Doostdar of Oneworld Publications, Meike Ziervogel of Peirene Press, Kamaljit Sood of Anthem Press and many others), as I was signing my book, an author sneaked in and said: "I want to show you my two books." "I don't think this is the right time or place," I said. "We are having a party and this is a book launch." "Well, if this is a party and a book launch, then I demand a book review!" I let out a deep sigh. "What is your book about?" "It's a Zoroastrian book." "We don't do Zoroastrian books." And she left. So, if you are planning to get into publishing, remember something: the easiest way out is always: "Not our line, doesn't fit in with our list." 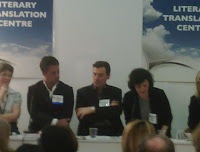 Then I had meetings, a talk at a packed seminar, where I almost nodded off (see photo), the stress of placing a reprint for the above book plus stickers, another talk at a even more packed seminar, then the Bestseller launch party, then a dinner with one of our authors, then this blog. What a life! Shame I couldn't go to the Canongate party . 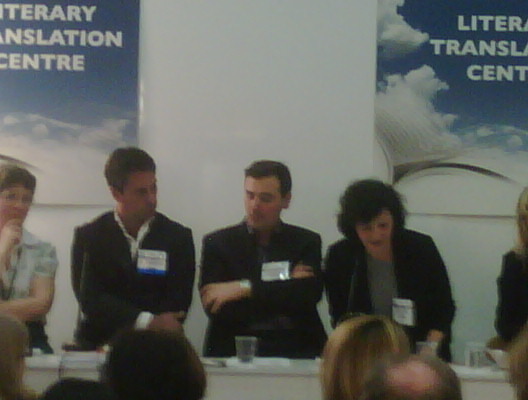 . .
First day at the London Book Fair. There were very few overseas delegates, but the Fair felt busy nonetheless. But the problem was that many appointments were cancelled, so mad authors – always on the prowl at LBF with their handouts and trolleybags – could easily spot an opportunity to come and introduce themselves, even if we tried to look occupied or hide behind our spinner. An unpublished author gave me a list of people who had endorsed his various fiction and non-fiction titles – all unknown people except Doris Lessing (she can't possibly have endorsed you, mate. Or maybe she has?). He went away saying that if he finds a publisher he'll be a very happy man. Another one said that one of his books had received an Amazon review, and after a pause he added: "A real one". Another one tried to interest me with a brief description of his book. I said no. He said just a brief one. I said I didn't have time and the bookfair wasn't the appropriate place to talk about this. He said just a minute. I said sum it up in one word. He said "deforestation". I said: not for us. Another author announced he was a shaman – and at that point I looked at the sky. We went to two parties but stayed only for a short time as we're knackered and tomorrow is such a long and busy day (Orange short-list announcement, 3 seminars in which I am involved, launch of Bestseller, meetings, more parties). That's me opening a newly delivered box of catalogues and getting a nasty paper cut on my index finger. @£$%! Why does it happen all the time? I have been in publishing a few years, and I should know how much it bloody hurts. And it's not the first time I open a box full of books. I'm sorry for all the trauma and disruption that the cloud of ash is causing across Europe, and especially here in the UK. And I am also sorry to see that most of the overseas delegates will not be able to attend the London Book Fair. The halls will be empty, parties won't be as busy as usual, and most of the international events will be cancelled too. However, here in Richmond it's been paradise for the last few days. No noisy plane every minute overhead means that we have gone back a century or two – and the Green yesterday, with the clear sky above and the white villas around, with kids playing around and people basking at the sun, was as good a place as there ever was on earth. Wouldn't it be good if we could go back to horses and trains? The Death of Vanity Publishing? Has self-publishing spelled the end of vanity publishing? I remember those fine publishing houses, usually based in places such as Kingston-upon-Hull, Morpeth or Truro, which offered unpublished authors a complete service, from editing to typesetting, printing, marketing and publicity for the modest sum of a few thousand pounds. I wonder if they have survived the digital revolution. Publishing your own book today costs dozens of pounds as opposed to the thousands of yesteryear. Of course often the quality is the not the same, the cover is a bit rubbish, the publisher's name is something like Dead Hippo Press – but who cares so long as the words are all in there, between cover and cover? The Bookseller recently reported that book production topped one million titles (1,000,000!) last year, of which around three quarters are print-on-demand (out-of-print books being resurrected using the latest technologies) and self-published. POD and self-publishing appear to have grown 2,242% since 2002. The title output of mainstream publishers has remained unchanged, which suggests that there's still a strong demand for traditional books, but it's easy to foresee a time in the not too distant future when the mainstream production will start to shrink and be all but swamped by an ever-growing mass of on-demand books. They have been silent for entire generations, and they have a reputation for being one of the quietest peoples on earth, and now their banks go bankrupt leaving thousands of UK investors in the lurch and have a volcano eruption covering with ash most of the UK and creating all sorts of disruption here. Is this all part of some secret plot that we still cannot figure out? Next, Danes or Norwegians will invade Britain again . . .
We are delighted that another Alma book has made it into the longlist of a prestigious literary prize. 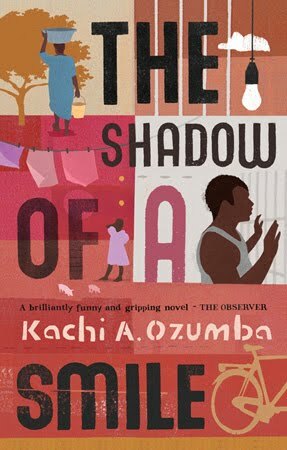 Kachi A. Ozumba's The Shadow of a Smile – a poignant, blackly humourous story of suffering, injustice and redemption – was longlisted for the Desmond Elliott Prize for debut fiction. The book is also on the shortlist of the Commonwealth Prize, so all the more reason for rejoicing. Back on Sunday afternoon, and it feels already as if I've never been on holiday! Piles of post, emails, submissions, bills, phone calls, deadlines . . . sigh! Luckily enough the London Book Fair is starting on Monday – a welcome break from the horrors of the office. There's a few things I should report, but I'll wait for better, less frantic days. Stay tuned. Windmills are quite a scary thing, and I can understand how the Knight of la Mancha could take them for formidable enemies. We visited the series of twenty-odd windmills in Kinderdijk (about 25 miles from Rotterdam) yesterday, and were able to climb to the top of one of them which was open to the public. Quite interesting, but the surrounding landscape was even more interesting: a mixture of idyllic countryside and modern noisy factories. Today back to Bruges, and tomorrow back to England and the daily grind. A sumptuosly sunny day today after yesterday’s greyness. We went to Den Haag in the morning – great, elegant city, and visited the Mauritshuis Museum, which hosts, in a couple of rooms, around a dozen all-time masterpieces of painting (all by Vermeer and Rembrandt, although there’s a few interesting paintings by Hals, Van Eyck, Holbein, Bruegel and others). Because The Hague is not on the main touristic routes (for the time being!) and it was a Thursday morning, we could actually see the paintings without having to elbow our way to the front. I spent five minutes gaping at The Girl with a Pearl Earring (which we saw before at the Vermeer exhibition at the National Gallery a few years back), and ten in front of Vermeer’s View of Delft, the real reason why we went all the way to Den Haag. The Rembrandt paintings were also very impressive, not just his self-portraits (which seem to be in every gallery in the world) but his famous Anatomy Lesson of Dr Nicolaes Tulp. After lunch we decided to see the real Delft, Vermeer’s city, and what a discovery it was. Without a doubt, it is the highlight of our trip so far. If you’ve never been there, we heartily recommend it. It’s a gem of a city – easy to visit, beautiful and surprising at every corner. The flower market was on, as well as a big market in the main square, between an impressive old building and the New Church – new as opposed to the older one a few hundred yards away – dating back to the fourteenth century. After a brief stop at our hotel in Leiden, we were off again at around 7:00pm, this time bound to Amsterdam, which we had visited a few times before we had our kids. We were there in little more than half an hour, parked a couple of hundred yards from the Dam and had a lovely dinner at Gauchos – which, funnily enough, I think is the same chain we have on the riverside in Richmond. So this is Holland in a nutshell – a lot of life, history, culture, variety, and all very close at hand as it’s a relatively small country. We are loving it. Stuck in traffic for one hour around Leiden. The weather has turned grey . . . It's always interesting to see, when you travel, some of your prejudices smashed to pieces and others embarrassingly confirmed. When I thought of Belgium, a country I had only travelled through but never visited in the past, two words would come to mind: "boring" and "grey". So what a nice surprise to come to a very sunny and lively Bruges, and travel around Belgium and find it so green and interesting (especially from a historical point of view). But let's have a look at how some of my other deeply ingrained prejudices have fared over the last forty-eight hours. Food: I thought it was terrible, and this has sadly been confirmed. Beers: Belgian beers have a great reputation, but I have given up alcohol for good (at least until the London Book Fair), so. . . Weather: I imagined it to be as overcast as Hull or Aberdeen on a bad day. Not so during these two very warm and sunny days. People: the cliché wants them dull and phlegmatic, but they seem lively and nice enough, even outside a tavern. Trains: boringly over-punctual. Alas, not true: our train to Gent this morning was sixty-two (62) minutes late. It is true that the woman who made the announcement on the Tannoy cried, but still it's refreshing to see that Flemish and blemish can occasionally live together. My first impressions of Belgium are very positive. It doesn't seem a cutthroat society. There are many nice shops, elegant people, beautiful houses, lots of green, many farms with animals near cities, which has to be a good sign. There seem to be few cars (thousands of bikes are parked in front of the station – what a contrast to many other European cities) and relatively few people around. Maybe that's the trick. Amazing that this lovely place is only around an hour's drive from Calais. Tomorrow morning, off to Leiden. As I write this, I have two books on my desk and about three hundred and fifty (and growing) on the bookshelves around me. The two books are a collection of poetry that I published around five years ago, A Modern Bestiary, and the finished copy of my first novel, Bestseller, to be launched at the London Book Fair on 20th April. The three hundred and fifty books around me are the ones I published over the last ten years, first at Hesperus Press and then at Alma Books and Oneworld Classics, most of them works in translation by some of the authors I admire most in world literature. Although I am very proud of my achievements as a publisher, I wouldn’t hesitate to say that, really, my heart is in writing. I could actually go further and say that if I became a publisher it was probably only in order to get my own works published. . . The book, my book, has come back from the printers – what a wonderful job they did. I was almost afraid to open it, in case a glaring typo would jump out at me. However, Bestseller passed the flick-through test, the scariest one. It was an amazing week, with the Oneworld Classics and the Alma Books catalogues sent to the printers and the preparation for the launch of our Overture Opera Guides. Please have a look at the Oneworld Classics catalogue here, and the Alma Books one here. Or if you prefer a hardcopy, please send us a message. Off on a trip to Holland and Flanders next week – I hope I'll be able to post reports – otherwise I'll talk to you when I'm back. Alessandro Gallenzi is the founder of Alma Books and Alma Classics, and the successor of John Calder at the helm of Calder Publications. As well as being a literary publisher, he is a translator, a poet, a playwright and a novelist. His collection of poetry Modern Bestiary - Ars Poetastrica was published in 2005 to critical acclaim and his novel Bestseller was published in 2010. Alma Books publishes from fifteen to twenty titles a year, mostly contemporary literary fiction, taking around sixty per cent of its titles from English-language originals, while the rest are translations from other languages such as French, Spanish, Italian, German and Japanese. Alma Books also publishes two or three non-fiction titles each year. Alma Classics aims to publish the greatest recognized masterpieces of all time, from every literature and genre, but also tries to redefine and enrich the classics canon by promoting unjustly neglected works of enduring significance. Recently Alma Classics launched Overture Publishing, which provides a series of beautifully produced opera and classical-music guides which are unique in the English language.